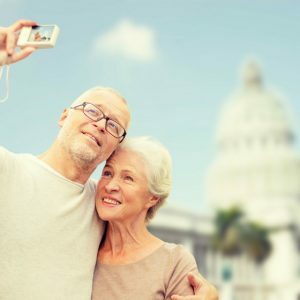 Many seniors are fortunate enough to enjoy traveling the world during life’s later years. With a little planning and preparation – especially when it comes to travel vaccines – they can safely visit many different destinations, in or out of the country. Before jet-setting off to an exotic locale, it’s important that seniors do what they can to stay healthy and safe and to protect themselves from serious illnesses while traveling. Seniors should see a doctor in advance so they are aware of recommended travel vaccines and are up-to-date on routine immunizations. See a doctor for a pre-travel visit. Make an appointment with your health care provider at least four to six weeks in advance of travel to discuss detailed travel plans and medical history. Some vaccines could be required for you to travel to certain destinations. And, because you may run the risk of encountering different diseases depending on the place you are visiting, travel vaccines will vary. For example, you may need the yellow fever vaccine if traveling to certain countries in Africa, Central America or South America. Tell your doctor about any illnesses you may have, as well as all medications you are taking as these may affect some of the required travel vaccines. Seniors may want to also consider getting a physical exam to evaluate fitness level and any physical limitations. For example, if you have trouble with mobility, consider how much walking the trip will require. Those with heart conditions might choose an itinerary that does not involve strenuous activities. Seniors also tend to have a hard time recovering from jet lag and motion sickness, so take these things into account when planning your trip. Before travel, seniors should be current on routine vaccines. These are the standard child and adult immunizations recommended for the general U.S. population, such as measles/mumps/rubella and seasonal flu. The diseases these vaccines protect against can be more common in other countries than in the United States, so it’s important you understand which of these routine vaccines you need. Your doctor may suggest additional travel vaccines depending on the countries you are visiting. These could include vaccines for hepatitis, typhoid, polio or yellow fever. Remember that some vaccines need time to start working, and some require more than one dose, so planning weeks in advance is key. More than 50 percent of tetanus cases are in people over the age of 65. Traveling seniors should think about getting a tetanus shot. Pack enough of your regular medicine for the duration of the trip, plus a few extra days’ worth in case of travel delays. Prescription medicine should be carried in original containers. And all medications should be packed in carry-on luggage. Protect yourself from bug bites as some insects can spread a number of diseases. Select safe modes of transportation. Know how and where to get medical care while traveling. Find out how to protect yourself while traveling. Recommended vaccines are listed by country on CDC’s destination pages. Read more about which important immunizations are right for seniors.